For most, Christmas Day is a time to celebrate the birth of Jesus Christ or at least a holiday to get cosy with all the family and tuck into a juicy turkey with all the trimmings. But the world doesn't stop because people are on holiday as well as present giving, as may people try to attempt some world records based on Christmas. 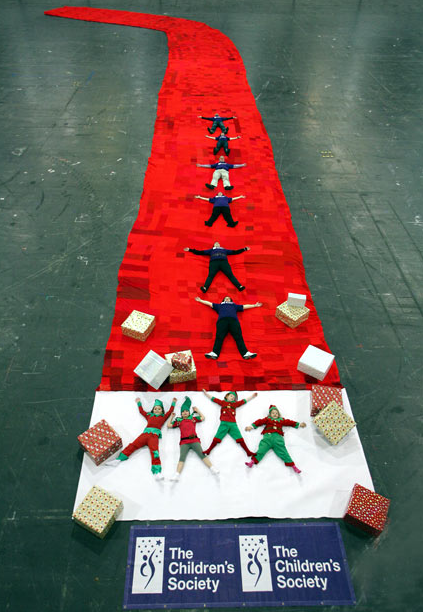 We look back through some of the most significant Guinness World Records With A Christmas Themes. 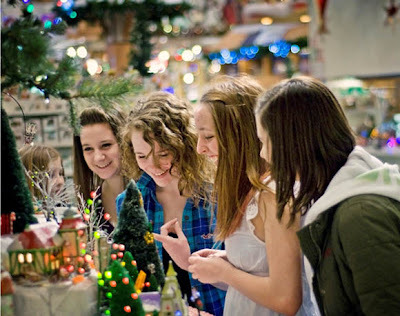 Largest collection of Santa Claus memorabilia: Jean-Guy Laquerre (Canada) has 25,104 different items of Santa Claus memorabilia, as of 30 November 2010, that he has been collecting since 1988. 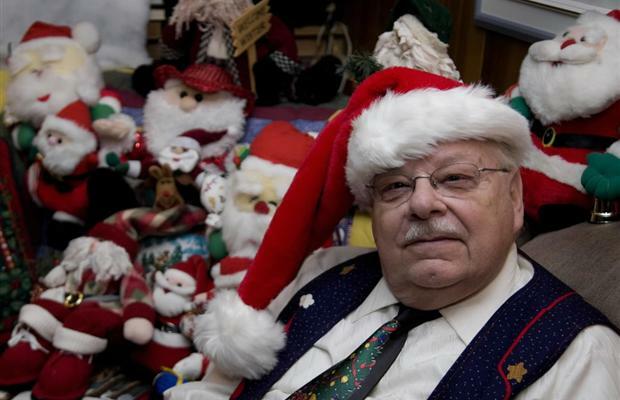 His collection includes 2,360 figurines, 2,846 cards and postcards from 33 counties, 1,312 serviettes and 241 pins and brooches. 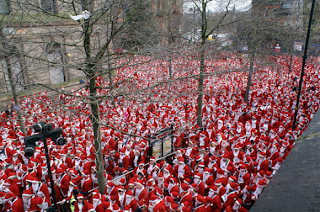 Largest gathering of Santa Clauses: The largest gathering of Santa Clauses was achieved by 13,000 participants in the Guildhall Square in Derry City, Northern Ireland, UK, on 9 December 2007. 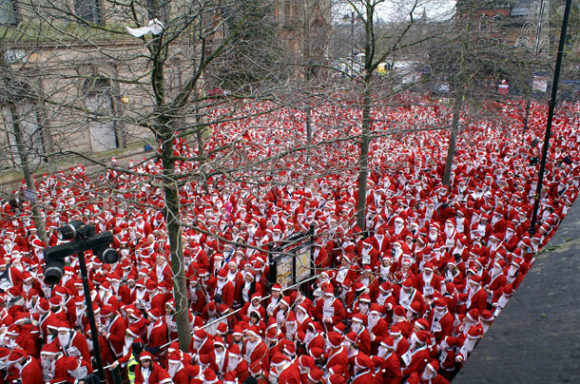 Largest gathering of Santa's elves: Nearly 800 people in Bridgend, south Wales, set a new world record for the largest gathering of people dressed as Christmas elves. 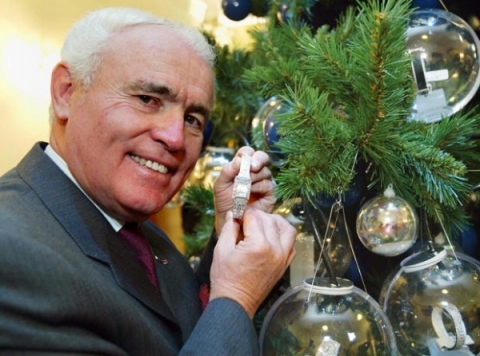 The previous world record of 607 was set in New York City in December 2009. 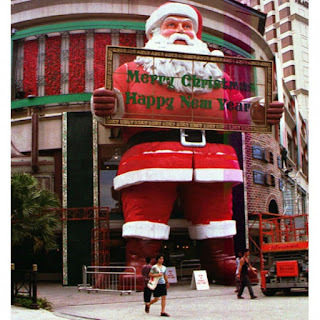 Largest Santa: A Santa measuring 15.6 m (51 ft) high, 11 m (36 ft) wide and 4 m (13 ft) deep stood at the entrance to the Tanglin Mall, Singapore, from November 10, 1996 to January 3, 1997. It weighed 2.5 tonnes and was constructed from polyfoam and metal. 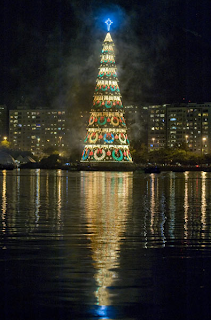 Largest floating Christmas tree: The largest floating Christmas tree measures 85 m (278 ft 10 in) in height and was erected as an annual tradition in Rodrigo De Freitas Lagoon in Rio De Janeiro, Brazil for Christmas 2007. 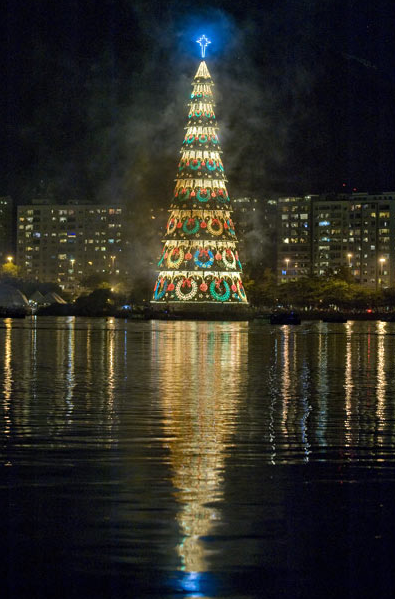 The tree was sponsored by Bradesco Seguros e Previd ncia. 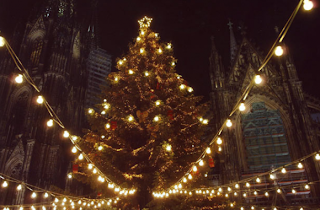 Most lights on a Christmas tree: The record for the most lights lit simultaneously on a Christmas tree is 150,000 for the RTL-ChariTree 2006. The feat was achieved by RTL Television GmbH, Germany, on 22 December 2006 at the Cologne Cathedral, Cologne, Germany. 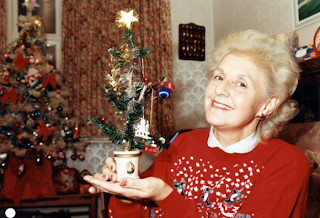 Oldest Christmas tree: Every year, Janet Parker of Chippenham, Wiltshire, UK, puts up her Christmas tree, which was purchased - possibly from Woolworths - for her Great Aunt in 1886. Standing 30 cm (12 in) high in an ornate pot, it gets decorated with cherubs and the Virgin Mary. Largest Christmas stocking: The largest Christmas stocking measured 32.56 m (106 ft 9 in) long and 14.97 m (49 ft 1 in) wide (heel to toe) and was made by the Children's Society (UK) in London, UK on 14 December 2007. Largest advent calendar: The largest advent calendar is 71 m (232 ft 11 in) high and 23 m (75 ft 5 in) wide and was built at St Pancras station, London, UK, to commemorate the station's refurbishment in December 2007. 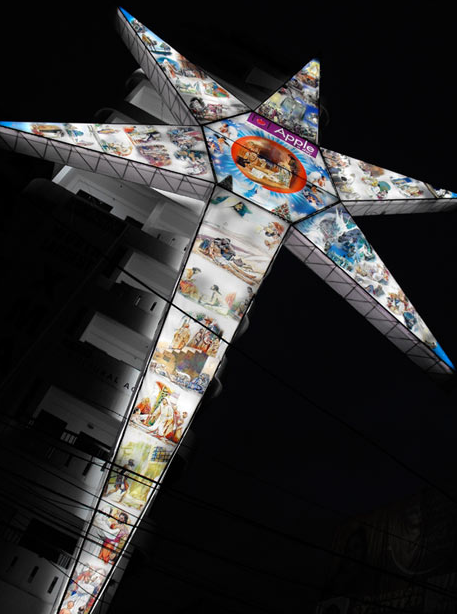 Largest Christmas star ornament: The largest Christmas star ornament measures 31.59 m (103 ft 8 in) tall and was achieved by Apple A Day Properties (India) and unveiled in Kochi, Kerala, India, on 31 December 2009. 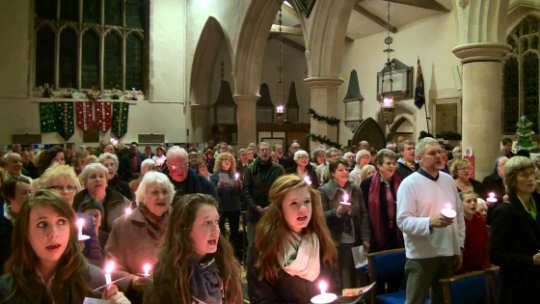 Largest secret Santa game: The largest secret Santa game involved 1,270 participants in an event organised by Boots UK Limited at their head office in Nottingham, UK, on 18 December 2008. Best selling Christmas single: 'White Christmas' by Bing Crosby, has sold over 100 million records around the world since its release in 1942, though that figure includes album sales. 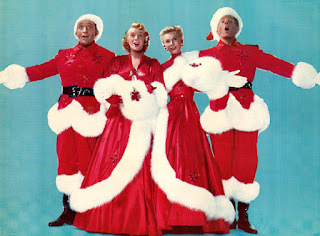 It is the best-selling single of all time, with sales estimated to be more than 50 million copies worldwide. 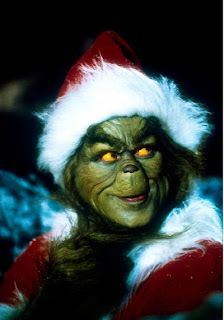 Highest grossing Christmas-themed film: How the Grinch Stole Christmas (USA 2000). Budget: $123 million ( 82.4 million). Gross: $340 million ( 227.7 million). 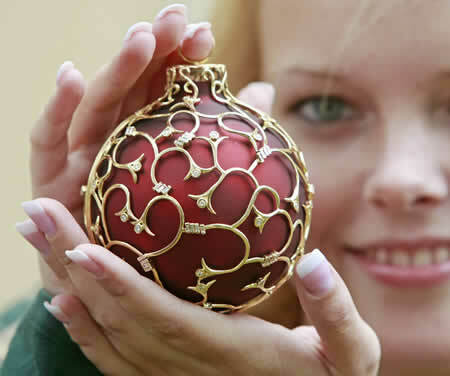 This one is arguably the world’s most expensive Christmas ornament. Produced by Krebs Glass in Germany, the bauble is decorated with solid 12kt gold and 120 VS1 diamonds with a total weight of 5.1 carats. 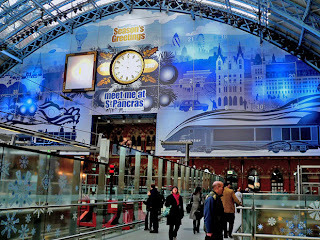 Price – $31,000.